The extraordinary village of Gourdon in the Provence, France in Europe sits on a rocky cliff overlooking the Mediterranean coastline. The village of Gourdon in the Provence, France is perched high upon a ridge and was built in the 13th and 17th centuries. The unique village is at an altitude of approximately 760 meters and is located about 12 kilometers northeast of Grasse.Words cannot explain how spectacular the scenery from the village of Gourdon, France is as it overlooks the magnificent landscape and the amazing coastline of the Mediterranean Sea. In the village of Gourdon, France you will see houses made from yellow stone that were built in years past and still hold up to the elements of Mother Nature.The ancient village of Gourdon, France is worth the detour off the highway where you can see heritage sites as you wander the winding streets of the village. Discover unique stores stocked with local arts and crafts, paintings, perfumes, soaps, honey, nougat, and many other personalized items.Village of Gourdon, Village Perche, on the a rocky cliff, Alpes Maritimes, Provence, France, Europe. 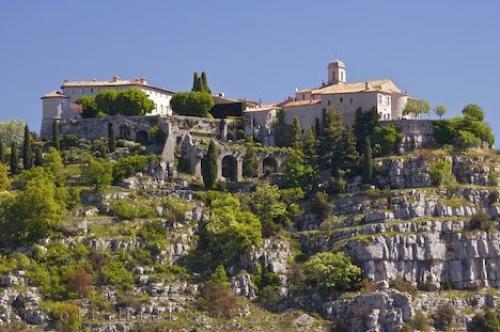 Photo of the village of Gourdon roosted upon the hill in the Provence, France.